Clandestine weapons like the World War II FP-45 pistol, later dubbed the Liberator by the Office of Strategic Services in 1944, have always intrigued me. It remains the rarest of American martial handguns from the conﬂict, with original examples usually starting in the $1,500 range for rusty, damaged pieces and the best examples, with their impossibly rare waxed shipping boxes, bringing over $7,000. Myths and misinformation hide the pistol’s real story; they weren’t wildly inaccurate junk guns that exploded after a few shots, and they were never tossed out of airplanes over occupied Europe en masse. The Vintage Ordnance Co. creates a build-it-yourself kit of the FP-45 Liberator, which cosmetically matches an original Liberator (left) well. THE FP-45 PISTOL was inexpensive by design. 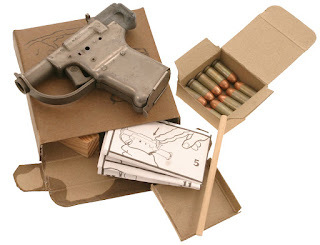 Constructed mostly of welded, stamped sheet metal parts with a die-cast zinc cocking piece, each gun cost the federal government a bit over $2, boxed for delivery with 10 rounds of .45 ACP ammunition. Only 5 inches long and weighing a pound, this single-shot pistol was conceived as an instrument of chaos in the darkest times of the war. The idea seems to have originated with a Polish military attaché in March of 1942. His request for assistance with arming resistance ﬁghters in Nazi-occupied areas was important enough that it reached the attention of the American assistant chief of staff for intelligence (G-2) of the War Department General Staff. In a little over two weeks, the Joint Psychological Warfare Committee completed a detailed plan of action and recommended urgent implementation, which was supported by Army Chief of Staff George C. Marshall. They recommended a light, simple, inexpensive, powerful handgun that could be dropped from aircraft – or other distribution methods they might contrive to suit the circumstances – to litter the countryside of occupied nations. Once delivered in theater, these little handguns would subject the enemy’s garrison troops to great mental anguish because even though they would ﬁnd some of the weapons, they would never know how many they didn’t ﬁnd. Hopefully, their anxiousness would be heightened by some fatal close range head shot casualties too. The expectation was that at least some of the weapons would be found by those intrepid souls who dared to resist the yoke of totalitarian rule forced on them by Germany and Japan. SIX MONTHS LATER on August 21, 1942, one million FP-45 pistols had been completed. The FP designation stood for “ﬂare projector,” and was part of a subterfuge to mislead enemy spies. Manufacturing was done in total secrecy at General Motor’s Guide Lamp factory in Anderson, Ind. The assembly work took an astonishing 11 weeks. Three hundred employees worked around the clock to put together the 23 individual parts that made up each pistol in an average of 6.6 seconds. It took them less time to assemble it than it took the average shooter to load and ﬁre the weapon. It was a manufacturing tour de force, and Guide Lamp would later receive the contract to make the M3 submachine gun, which also utilized efficient welded sheet-metal stampings. WITH 100 BOXCARS OF FP-45S at the Allies’ disposal, differences of agreement, some political and some practical, arose about how to best utilize them. In the end, the majority of the pistols were destroyed, but a signiﬁcant number – perhaps 383,000 – were at least sent to active theaters of war with no record of their return. General Dwight Eisenhower, Allied commander in the European theater, got 500,000 FP-45s. He felt that air dropping them wasn’t a practical use of his precious air resources that were better utilized dropping bombs on the enemy. Contrary to the tales of mass airdrops, usually involving second-hand oral history from some now-deceased relative who did it, there is no written evidence showing that the FP-45 was ever distributed in any signiﬁcant quantity in France. Ralph Hagen, in the research for his superb book The Liberator Pistol, collected and conducted many interviews with key people involved in American-, British- and even German-military intelligence and clandestine operations from the time, as well as accounts from French resistance ﬁghters. None of them could support anything other than a token distribution in the theater, if that! Of the half-million weapons sent to England, less than 1,000 guns were sent to Sweden, and some small unknown quantity was issued for the D-Day operation. There is also one known veteran account of an FP-45 being used by a 101st Airborne paratrooper at Bastogne during the Battle of the Bulge. He stated that he was given the pistol and an orange ﬂare cartridge to signal his position to armored American units trying to relieve the surrounded soldiers. More of Eisenhower’s 500,000 FP45s went to the British War Office than anywhere else. The 30,000 they received went to the Suez, India and Gibraltar. What happened to them there is not known. This is the case with most of the pistols sent into the active theaters of the time. Once they arrived, any written record of how they were ultimately used has yet to be found and probably no longer exists. IN THE PACIFIC THEATER, General Douglas MacArthur was much more interested in the FP-45 pistol than his European counterpart. MacArthur requested and received 50,000 guns in total, which he appears to have made use of. Unlike the other theaters of war, there is solid written evidence that the pistols were distributed in the ﬁeld. MacArthur himself indicated in a report that he had used the ﬁrst 8,000 guns to arm native villagers in the Solomon Islands of Tulagi and Guadalcanal. American veterans returned home from this area with souvenir FP-45s. The pistols were clearly used by the Philippine guerillas, and I have personally found original guns there. Some were delivered by submarine. Others may have arrived by airdrop, though the complexity of ﬁnding anything airdropped into the jungle suggests that wasn’t likely. Airdrops on the coastline, however, were made. The second largest shipment of guns from America numbered 200,000 and was delivered to Calcutta (now Kolkata), India, in July of 1944. Forty thousand went on to Ceylon (now Sri Lanka) and another 44,000 to Burma. The rest were destroyed after the war. The third largest shipment was 100,000 guns destined for Jorhat, India, in August of 1943. Their ultimate destination was China. There is evidence that the pistols did make it into the hands of the locals, guerillas and bandits alike, but exactly how many will never be known. The only recorded image of an FP45 pistol in theater during World War II shows the pistol in the waistband of an Asian man in Kunming, China. In July of 1944, another shipment of 40,000 was delivered in Algiers, Algeria, and some of these guns are known to have made their way to guerilla operations in Greece. 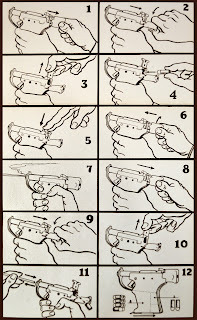 Easily understandable drawings detailed how guerilla forces were to load and unload the original FP-45, along with where to find more bullets. THE NUMBER OF FP-45 pistols actually used to ﬁre a shot in anger is a matter of speculation only. Guerillas can’t be faulted for poor record keeping. It’s probably pretty hard to write a report with a Nazi or Japanese patrol hot on your trail. But for most of my adult life I’ve wondered what it was like to shoot an FP-45. If I was a Greek partisan in Thrace, or a Philippine guerilla in Luzon in 1943, could I actually make a one-shot kill with this clumsy-looking gun? I decided to make a replica of the Liberator. of 1942 was test ﬁred for inspection. 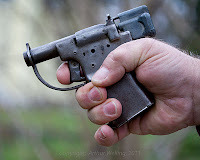 In creating the Vintage Ordnance Co. replica, I worked from the original plans and corrected against the actual pistol. The existing plans alone were not enough to build an accurate replica. Inconsistencies between the ﬁnished product and the plans were often dissimilar, which was typical due to the urgency of production. Often, design adjustments were made on the factory ﬂoor and never recorded on the drawings. Guide Lamp only expected their FP-45 to have a 50-round usable life, which was plenty for its intended purpose. Collectors today would ﬁnd that unacceptable. The “Better than the originals” objectives of my project centered on using stronger, tighter tolerances, materials, precisely controlled welding and accurate headspace. All of those improvements ensured my reproduction FP-45 was strong and safe to shoot without the built-in expectation of failure that makes ﬁring an original a fool’s errand. I made the barrel, tube strap (breech ring) and cover slide (breech block) out of 1050 medium-carbon cold-rolled steel for greater strength. It’s the same steel Browning Automatic Riﬂe receivers were made of. I tightened the chamber tolerances to meet commercial standards and addressed the terrible headspace problems of the original that allowed them to batter themselves apart under repeated ﬁring. Also, my reproduction zinc cocking piece is cast from a denser alloy for greater strength. Cosmetically, the replicas differed from the originals in a few ways: the reproduction has a riﬂed barrel and discrete markings to comply with federal law, and hopefully prevent it from being unscrupulously sold as an original antique. I marked the serial number on the front of the grip frame and company information, model and caliber designation on the underside of the barrel behind the trigger guard. All characters are the minimum 1/16 inch high. In the course of prototype testing, I ﬁred over 100 rounds over numerous sessions. It took a day to recover enough from the pounding this little pistol gave me to go at it again and ﬁnish the testing. These marathon ﬁring sessions with high-pressure .45 ACP 230-grain loads were the most unpleasant experience in my 30-plus years of shooting. The recoil is very stout for sure, but it is aggravated by the small grips and the grip angle. In my hand, I found that I had to angle my wrist upward to the limit of its range of motion to get proper sight alignment. I simply can’t hold the pistol tightly enough to prevent it from snapping my wrist back past that limit. I didn’t feel it so much in the ﬁrst 10 rounds, but it got progressively more painful to shoot the pistol. Another recoil characteristic was the tendency for the Liberator’s zinc cocking piece to move backward against the spring pressure, causing the point of the guide pin to stick in either the right or left side of the tube strap. This expedites reloading, but I have no reason to believe that it was an intentional design feature. Some ultrafast video recording showed that the cocking piece’s rotation under recoil appeared to be caused by the back of it hitting the shooter’s hand. keyholing, which he highlighted in his book The Liberator Pistol: Development, Production, Distribution. I shot two groups at each distance. Sight picture is somewhat obstructed by the guide-pin boss on the cocking piece. The cocking piece was originally designed without it. All bullets were clearly cut with riﬂing when recovered. At 6 yards I found the pistol to shoot approximately 9½ to 10 inches above the point of aim and slightly to the right. Both groups were 3¼ minute of angle, which is certainly suitable for the pistol’s intended purpose. With a few practice shots, a partisan or guerilla ﬁghter could easily get a feel for the Kentucky windage required to put the bullet on target. I found that I could consistently burst gallon jugs of water with a one-hand hold before the recoil got the better of me. At 20 yards, the point of impact was about 30 inches high and groups tripled in size from 8½ to 14½ inches despite my best efforts. This was clearly beyond the useful range of the original weapon, so it comes as no surprise that the replica performed in a similar manner. A target pistol this is not. The FP-45s trigger pull is not conducive to good accuracy. They take a lot of squeeze to move the cocking piece back and get the connector cammed off the sear. I measured it between 10 and 11 pounds. The FP-45 Liberator is renowned as one of the rarest American martial handguns from WWII. Editor’s note: Author Frank Jardim founded Vintage Ordnance in 2008. For more on the company’s products, go to vintageordnance.com.